In Touched By An Angel, David Shienkopf and Daniel Kent abstract a world where beauty has lost its significance for the educated. The bag of chips we ingest and the toilet where it all goes become a metaphor for cause and effect. Meaninglessness? First world onanism? Who knows? Kent’s fingertips, coated in the grime of Doritos, remind us not only of the gleam of commercial packaging, but they point us to the moment we ignore the Nutrition Facts and say yes to self-seduction. Whatever your sadness, the fact remains the orange powder is hard to resist. 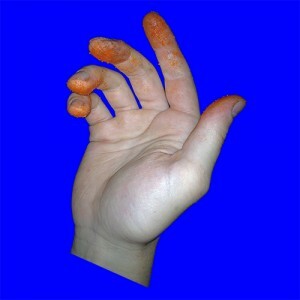 Do you wash you hands after eating Cheetos? Or like the rest of us, do you lick them clean?